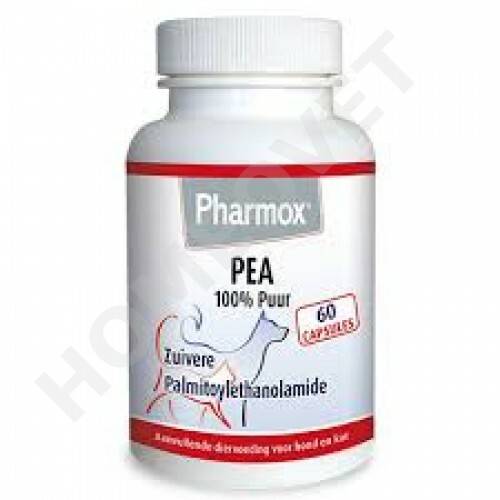 Pharmox PEA for dogs and cats contains the substance palmitoylethanolamide (PEA), a natural and fatty-acid like compound that relieves pain and inflammation. Palmitoylethanolamide has been investigated in several scientific studies and it has many positive results. PEA is a physiologically active molecule that the body produces naturally to restore balance in chronic pain and chronic inflammation. This supplement on the basis of palmitoylethanolamide acts as a natural analgesic and can very effectively combat chronic pain, it does require some time to be effective because it is working on a natural and biological way into the body of dog or cat (and human) . PEA encourages the body’s own natural healing and painkilling capacity to do its thing (* The Italian Nobel Prize winner Rita Levi-Montalcini in 1993 unraveled the mechanism of palmitoylethanolamide and since there are several double-blind clinical studies of the drug conducted references and studies. See Eg http://www.neuropathie.nu/deutsch/wie- wirkt-palnitoylethanolamid-pea.html, Keppel Hesselink JM, Professor Rita Levi-Montalcini on nerve growth factor, mast cells and palmitoylethanolamide, an endogenous anti-inflammatory and analgesic compound J Pain Relief 2013; 2:... 114). PEA can be combined without any difficulties with any other drug, painkiller or supplement, In case of doubt, it is recommended to first consult your Vet. There are no known significant side effects, no toxicity, no side effects. About the safety of PEA during pregnancy, there is insufficient knowledge . Therefore we recommend not to use this food supplement during pregnancy or lactation. All Pharmox products are specially formulated according to recent scientific insights. At Pharmox we only use high quality raw materials of pharmaceutical quality and purity. All production processes are carried out under the strictest guidelines. This way you are guaranteed the very best for the animals that you most care about.